It set a new world record blitzing the quarter mile in just 7.902 seconds. We’re still . 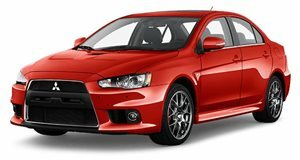 The legendary sports sedan may still make a comeback one day, but not for a long time as Mitsubishi is and for the foreseeable future. In the meantime, the EVO’s legacy still lives on today thanks to aftermarket tuners. Take this modified Mitsubishi EVO IX created by Extreme Tuners, for example, which was built with one objective in mind: to become the world’s fastest Mitsubishi EVO on the drag strip. And it's succeeded in spades. To make this EVO IX capable of extreme speed, the engine was destroked to 1.8-liters, but to compensate the Greece-based tuner fitted the engine with a massive turbo measuring 91 millimeters with a carbon-fiber impeller comically protruding out of the hood. The result? This is a Mitsubishi EVO that packs a whopping 1,700 hp. Such excessive power allowed the sports sedan to blitz the quarter mile run in just 7.902 seconds at 185 mph, making it officially the fastest Mitsubishi EVO in the world. It even revs up to 13,000 rpm which is frankly insane. Ironically, while the EVO is renowned for its excellent handling thanks to its all-wheel drive system, the driver has to fight to keep it in a straight line down the track, wrestling the wheel to keep it in check. It looks like one hell of a ride. Fortunately, his persistence paid off as the quarter mile run set a new record during the second run. As noted in the video, excessive wheel spin caused a clutch slip in the third run tuned to 2,100-hp which damaged the clutch and fifth gear.